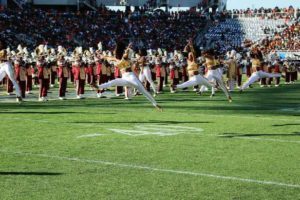 The Bethune-Cookman University Wildcats officially owns the Florida Agricultural and Mechanical University Rattlers on all grass surfaces, turfs and fields. 45,372 fans at Camping World Stadium witnessed it. This makes six times the Wildcats have successfully defeated the Rattlers 39-19 in the annual Florida Classic. That’s half a dozen victories homies. Yes, FAMU still leads the overall series but Rattler fans what have you done for me lately? Larry Brihm Jr, connected with Frank Brown on a 14 yard strike to put the Wildcats on the scoreboard 7-3 with 4:58 left in the first quarter. Minutes later, Tupac Isme rumbled into the end zone on a three-yard run that put B-CU up by 11 and a 14-3 lead. The second quarter was a continuation of the scoring prowess as Jamaruz Thompkins scored on a 1-yard run to put the Cats up 21-3. FAMU answered with a Desmond Noird pass to Devin Bowers to make the score 21-10 in the second. 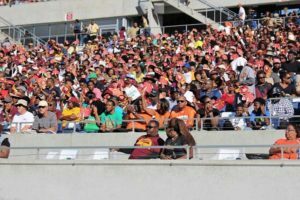 The Rattlers scored another field goal in the third to pull closer at 21-13 but the fourth quarter belonged primarily to the Wildcats. B-CU’s Akevious Williams accounted for two scores in the fourth. He evaded defenders for an 11-yard score and added a 44-yard run for another. By the way, Williams is but a freshman. His debut was against an earlier loss to Savannah State. The young man is going to be dangerous. Coach Sims has already dubbed him the QB of the future. FAMU managed a fourth quarter touchdown, courtesy of a Devin Bowers 3-yard run making the score 33-19. It wound up being the final tally. Jamaruz Thompkins’ 21-yard touchdown run brought frenzy to an end at 2:50 in the fourth quarter. By this time, Camping World Stadium was practically devoid of Orange and Green clad spectators. The win was the team’s fourth consecutive this season and the sixth consecutive win over the Rattlers in as many years. Brihm finished the game 21-of-27 passing for 270 yards and a score through the air on the connection to Brown. Brown also led all receivers with seven catches for 67 yards. He was named Florida Classic MVP. Redshirt freshman quarterback Akevious Williams led the Wildcats ground game with 67 yards on three carries, while Thompkins was good for 64 yards. Defensively for the Cats, Trenton Bridges led with eight tackles. Diquan Richardson collected five tackles and his third interception of the season. The FAMU offense was led by quarterback Ryan Stanley with an 11-for-25 passing day for 84 yards, while rushing for 57. The defense was sparked by Quenteze Gallon with 13 tackles, followed by Terry Jefferson with nine. He part of the Florida Classic some people missed out on was the great stuff the vendors were hawking. I arrived at 10 am and the smell of great grub was in the air. I saw an RV adorned with cannabis lollipops, numerous church folk passing out flyers, a group of speakers on the corner preaching the word, Old school Kappas tailgating and stepping, and scores of beautiful, melanated sisters. It was like an HBCU family reunion (since they drove Black College Reunion away). No, there was no grub from the Shirley Caesar song such as: Greens, Beans, Potatoes, tomatoes, lambs, rams, chicken, turkeys, etc, but there was certainly plenty of Conch, Shrimp, Fish, Ribs, Chicken, Turkey legs, Ribs, and Sausage and Onions. Yes, I thoroughly enjoyed the grub at the Classic. Breakfast consisted of Conch Salad, followed by the media meal in the Press Box, which consisted of salad, baked chicken, green bean & carrot salad, and bread pudding for desert. I was still belching Conch up but trust me, I made room for that “working media” meal. As I made my way down to the field, with a healthy mixture of Wildcats and Rattlers fans filing into the stadium, I saluted B-CU Band Director Donovan Wells and my frat brother/ Percussion instructor Pedro Orey before setting up to shoot pics of the team storming on to the field. Damn near got run over. The long-awaited battle of the bands at halftime did not disappoint. I thoroughly enjoyed the precision and showmanship of the Marching Wildcats. As always, Mr. Wells and staff had them ready. We hammed it up a bit before the game began. You can dig it on my Facebook page. 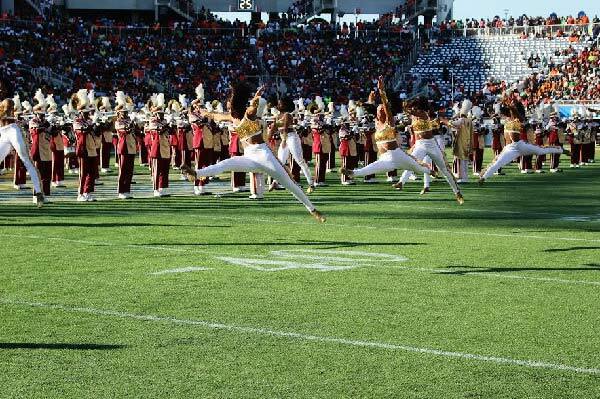 Sooo yeah, then came the Marching 100. 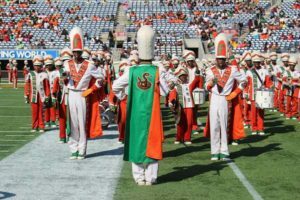 They performed last because FAMU was the home team for this year’s Classic. A couple of malfunctions with the famed marching unit will go down in history, like Rudolph’s nose. 1. A Tuba player was late to the field during the 100s field show. 2. The word “Jackpot” was misspelled in front of 45,372 fans is now viral. Facebook went crazy, Instagram went crazy, Snapchat went crazy. I’m uncertain if it made Sports Center. 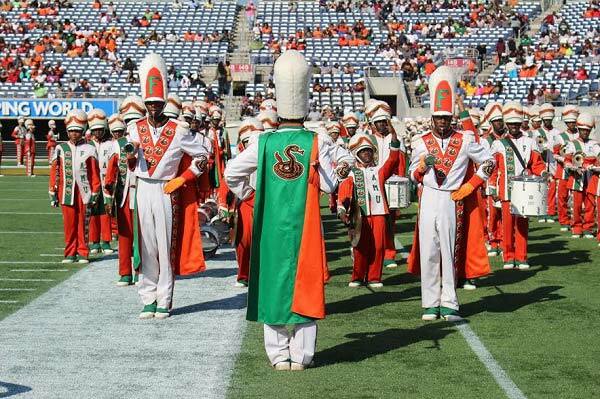 Florida A&M has an outstanding pharmaceutical program, their bands’ spelling? Not so good. I didn’t submit photos of the snafus. There’s enough of those on the world-wide web. 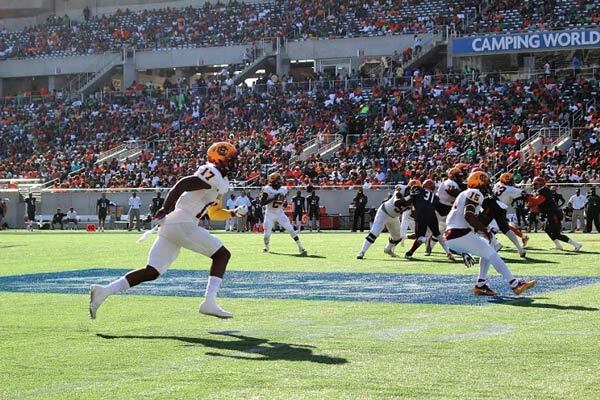 Overall, this year’s edition of the Florida Classic was an all-around great event. From the connections with old friends from each school, to the great grub, to the football action, to the battle of the bands, to the overall love/hate relation that makes the venue great. I had a blast. 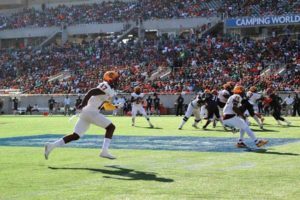 The game was everything anyone could ask for in an HBCU rivalry. Bethune-Cookman concludes the 2016 season next Saturday when the Wildcats visit Orangeburg, South Carolina to take on the South Carolina State Bulldogs at 1:30 p.m. This is a makeup game for the one Hurricane Matthew messed up. After that, we turn our attention to hoops, after all the name of the column is I Got NEXT!